Dr. Davis heads a team of Optometrists, and Ophthalmologist and Opticians in a private practice in Pembroke Pines, Florida. 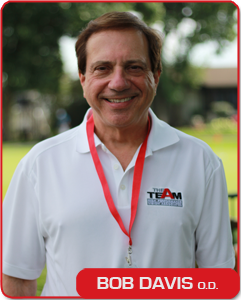 He is an adjunct Clinical Professor at Nova Southeastern College of Optometry, and Pennsylvania College of Optometry. He lectures nationally and internationally on Contact Lenses, Sports Vision, Computer Vision, Practice Management and Ocular Disease Treatment in such places as Australia, Thailand, Taiwan, South Korea, Colombia, all over Canada and the USA. He has been a featured speaker at the Southeastern Congress and the A.O.A. National Congress, and Vision Expo East and West. He has appeared on National and International television and has published many papers on all aspects of eyecare that have appeared in many of the major eyecare journals. He has done contact lens investigations for almost all the major contact lens companies. Dr. Davis is head of the Florida Institute for Sports Vision, on the advisory board of Essilor , a professional affairs consultant for Vistakon, , a past president of the Broward County Optometric Association, a member of the Corneal and Contact Lens Section and the Sports Vision Section of the American Optometric Association, the team Optometrist for the Miami Dolphins and has examined hundreds of professional golfers, tennis, baseball and basketball players from around the country. Dr. Davis has been recognized by many of his local civic organizations recently named President of his local Rotary Club.